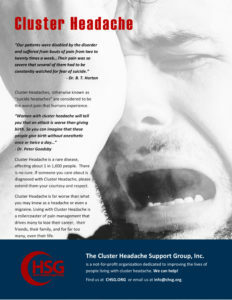 The burden of cluster headache is associated with significant co-morbidity, including substance use disorders and suicidal ideation, and treatment patterns indicating low use of recognized cluster headache treatments. A few weeks ago, CHSG was contacted by a reporter from CNN seeking video submissions from patients, describing the experience of cluster headache. Our family did not disappoint! Over a dozen courageous men and women submitted honest, raw, uncensored, unfiltered video of life with cluster headache. Seven were featured in the October 3rd CNN article.